The previous installment from drone pilot Matthew Roberts showed progress was being hampered by poor weather, with waterlogged grounds affecting landscaping efforts. Patches of water accumulated from the storms persist in the latest video, but the site as a whole seems to have drained sufficiently enough to dry off the majority of work areas. The research and development facility now has paving in front of the building, giving a solid surface to load, unload, and to park nearby. Lighting poles have also been put in place around all sides of the facility, illuminating not only the paved area but also walkways to the sides and rear. A walkway on top of the main transit tunnel is under construction, complete with trees to surround the pathway. Trees are also being planted around the fitness center, while another walking path is visible through the meadow area of the campus. While the auditorium is still covered up from the last video, preventing anyone from seeing inside, the landscaping continues at pace around the structure. Rows of trees spotted within the main circular "Spaceship" building in the last video are increasing in quantity, with more of the plant life put into position. On the outside edge, workers are using cranes to install more of the canopies on the windows, while others are adding finishing touches to those already in place. The solar installation on the roof is also making progress, estimated to be 70 percent complete. Work has seemingly completed on the garages, which are now being used by construction workers while they complete the rest of the project. 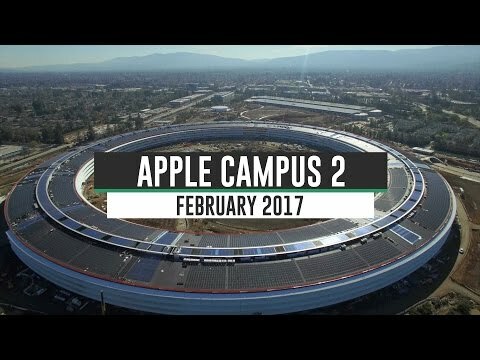 Apple aims to start moving its employees into Campus 2 sometime this year, with over 12,000 employees expected to work in the 2.8-million-square-foot "Spaceship" building once it is completed. Man they must have gotten a ton of rain. Thats probably not helping the ability to landscape which from the looks is pretty much the bulk of whats left on the exterior. I think it will really look nice outside when the grass gets installed. From here on it will look like not much is being done as I assume its mostly interior work now which the drone won't pick up very well if at all. I can't wait to see Apple introduce a new product from their new auditorium, hopefully very soon! On a sidenote...did I ever say how much I hate this forum software? Why is it that sometimes it does the paragraphs/line breaks correctly and other times I have to edit the post and MANUALLY enter in HTML break tags? Can't we find better forum software somewhere else? It makes it so frustrating to participate sometimes....sometimes to the point where I just say the hell with it I'm not gonna post anything because the software keeps screwing up. Give it two more months of progress and some favorable weather and we'll finally see the vision become reality, at least from the 500 foot view. We've been slammed here in California this month. Lots of places have received a years worth of rain from the last few storms. More rain this week too. Judging by the traffic, I assume that most, if not all of these videos are made on Sundays. Yet there were a few workers on site. If this wasn't a weekend, that's remarkably few workers for all that's left to be done. If it was a weekend, then I guess at least one crew is behind schedule and trying to make up time. It's looking as good as, or even better than, the original renderings! Truly futuristic design! Who wants to guess when the ribbon is cut? Which month this year? July? That will depend upon how they fit out and whether you include all the buildings or just the space ship. If they are using modular constructed off site pods for things like washrooms then that can save 3-6 months fit out. For the main building I go for June 2017. If the auditorium has lots of electronics, cabling, switching and controls then that could take a few more months, say to about August or September just in time for the new product launches at the end of September. Like I said, most of the work is inside now. The exterior work is pretty much done except for the landscaping and a little bit of solar panel installation left. I would say around May. I am worried. We have less then 5 months till WWDC, and less then 8 months for introduction of next iPhone. If you take a look at video 6 months ago and this one, the progress has been slow. At the current rate, the bulk of things, such as trees planting, payment, building structure etc , assuming no massive hiccup and assuming perfect efficiency they should be finished in 3 - 4 months time, ( Which I doubt you will get that in US ). But it is the finish touches that matters, likely takes longer then expected. And that is the bulk, the most time consuming things are interior, wires, electricity, systems, securities, cooling, etc and given Apple's extremely high standard, I doubt everything will be smooth, although they do have their own dedicated team of Interior designers for Apple Store, but that doesn't mean they could solve every problem in time constrained cases. The last thing you want is bringing in Journalist and VIPs to your half finished Apple Campus for the next iPhone Introduction. That's a mighty impressive structure. I'm wondering how this type of layout is going to contribute positively to impromptu collaboration opportunities when the employees are so widely dispersed around a huge ring. Since this design is a vision of Steve Jobs it makes me believe that there is a strategy for collaboration and interaction behind the layout in addition to it being an aesthetic masterpiece. I wouldn't invest any time being worried about it. They'll start moving people in when it's ready, and it needn't be everyone at once. They aren't going to host WWDC there. That's the entire point of it being circular -- people will be walking around and running into people. It's more likely than not that the people your work is related to is are going to be nearish to you anyway. Compare it to a typical office tower of small footprint but very tall via floors, and this is way more collaborative. There's no reason to panic. Its finished when its finished. This building is a huge undertaking. Apple could never host WWDC at AC2 anyways. There's no where for 5,000+ people to sit for sessions, keynotes, etc. They'll still need a 3rd party building for large events such as WWDC. Regular Apple announcements could easily be held in the new auditorium though. You don't need trees and grass to move employees in. We have no idea how far they are on the interior of the building. There's no real good way of showing this from drone videos. Apple just needs the auditorium to be finished in order to do presentations there which again, doesn't require trees or grass. I can't see the auditorium taking more than 6-8 months to complete and test. I doubt Journalists will be inside the actual main building anyways. 1) For the first time ever I think I enjoyed this video more than the one made by Duncan Sinfield. 2) Why does AI only link to Matthew Roberts' videos? 3) Am I the only one annoyed by how they all will shoot the video in a month that covers that month, but then name it for the following month. If you shot it on February 1st I'd be okay with them saying it's the February 2017 video, but if you shoot it on January 30th, it's still a January 2017 video. Literally nothing shown of the progress covers the month of February 2017.